Well Lane is one of the oldest lanes in the village and would have been well used given the ancient chapel of ease of St. Saviours which was situated near Tanyard Farm. It was thought to have had a wooden steeple and stained glass and said to have been ‘very ruinous’ in 1666. Further down the lane the name changes from Well Lane to Moss Hall Lane. The tithes map of 1846 shows this land was owned by Joseph Poole of Lane End Farm on Northwich Road and consisted of two cottages, occupied by John Barnes and John Pearson. In 1891 the two cottages were occupied by Thomas Bushell and William Highfield, but by 1898 William Highfield had moved away and Thomas Cooper moved in. The elector’s register of 1920 shows Thomas Wilkinson Cooper living there with his wife Bertha and family. Bertha died in 1939, but Thomas remained for another ten years with his son, William and wife. Thomas Wilkinson Cooper died in March 1949 and is buried in the churchyard. Next door was Thomas Greaves, brother of James Greaves from the Ring O’Bells. These two cottages were amalgamated into one house on the same plot by 1971, and the front door changed from facing south west to the opposite direction. The first owners of the new property were Mr. and Mrs. John Pitts, but they had left by 1974. The current house was built in 1968 on land that tithe maps show was owned by representatives of late Holbrook Gaskell, and the cottage and garden occupied by Thomas Eyes. Thomas Eyes was born 1776 and was an agricultural labourer. From the census returns of 1841 and 1851 it shows he remained at Thatched Cottage until his death in 1860 aged 88. In 1901 James Smith and his family were in residence. James was the nephew of Joseph Smith from Stretton Hall, and a slater, and had spent nearly all his life in Stretton. The census of 1911 records Frank Bostock and his family living at the cottage, having moved up the lane from Tanner’s Row where he lived previously. Frank was born in Stretton to Joseph Bostock and Mary Ann Holland. By 1915 Frank had moved to Primrose Hill following the death of both his parents and nephew (Jack Bostock in World War One). In 1930 he moved to Roadside Cottages, Hatton Lane and died in 1946. The Register of 1939 shows Thomas and Clara Griffiths were living at the cottage. In 1945, the cottage was occupied by Thomas and Ellen Hankey. By 1951, Ellen’s mother Elizabeth Simpson had joined the couple. Thomas died in the 1950s but his widow remained until her death when the house was demolished. See note below from Andrew Wilson whose memories can be found at the bottom of this page. 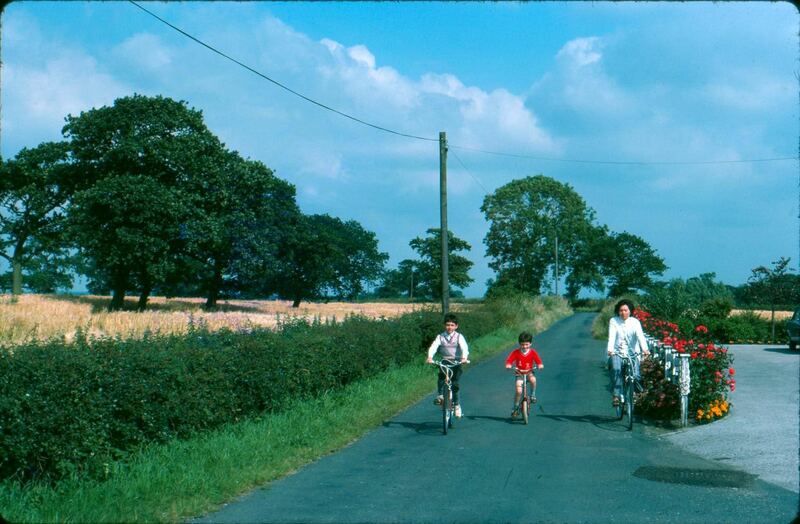 Going back up Well Lane from Tanyard Farm House there are two new (1970′s!!!) houses on the left. They are built on the site of what turned out to be a very old timber frame house that we demolished around 1967. Its roof was asbestos sheeting which had been put on as a repair in the 2nd World War. Its original roof had been blown off by a stray German bomb which landed in the field opposite. Apparently the bombs had been intended for targets in Warrington but were jettisoned early. The age of the house was not realised until we had begun its demolition, when we found it consisted of timber frame with brick infill. We also found what was obviously a much older part under the stairs where the wall under the plaster was still made from wattle and daub. We managed to extract that “slab” of wattle and daub intact and took it to the Warrington museum. I have no idea if it is still there, or if it ever went on display. Perhaps I should make enquiries!! This photo below kindly supplied by Julia Whitefield is the first photo we have of Thatched Cottage – although obviously not thatched in 1962/3 when the picture was taken. 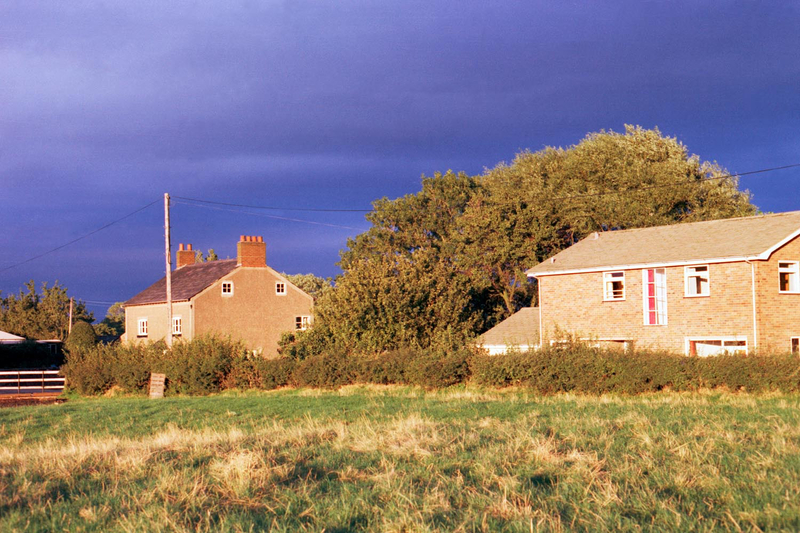 It’s the small grey cottage next to Little House in Common Lane, forming the background to a photograph of her sister on the way to Walking Day. In fact, the the gateway leading to the front door was actually on Common Lane and the cottage faced Common Lane. The new houses were moved round the corner onto Well Lane. The first owners of the new house were the Martin family. The farmhouse is a Grade II listed building which was built late 17th century/ early 18th century. A chain hung in the chimney where they used to cook the roast. In the census of 1841 Peter Jackson and family were recorded as living there. The Tithe map of 1846 shows that the farm was owned by Thomas Percival, and still occupied by Peter Jackson. The family remained until around 1860 until they moved to Bold with two of their married sons and families. Their eldest daughter, Martha, married John Newton from Moss Hall, just down the lane. Peter and Eleanor Jackson are buried in the churchyard at St. Matthews. The owner Thomas Percival farmed at Antrobus and was married to Sarah Forrest of Fir Tree Farm. In 1861 Tanyard was farmed by John Moore and family who had recently moved from Seven Oaks in 1859. They did not last long, but enough for four children to be born in Stretton. By 1870 they had already moved on again, this time to Flash Farm in Antrobus. In 1874 Thomas Drinkwater was recorded as living there, having moved from Rooley Moors. In 1882 Joseph Smith from Stretton Hall bought Tanyard Farm from the late James Whitlow of Garland Hall, Crowley, and Frederick Walmsley a joiner moved in with his family. They stayed for nearly 20 years but in 1898 M Rogerson had replaced him and in 1900 the electoral register shows Mary Millington had moved in to the farm house. The land was farmed by Arthur Smith, son of Joseph Smith, whilst living at Stretton Hall with his parents. By 1911 the farm house was occupied by Charles Mounfield and his family. Charles was the cousin of George Mounfield who went on to run the Beehive Stores with his son Percy. He married Mary Jane Rutter who lived at Spring Bank, Northwich Road. In 1914 it had changed hands again and Ernest Taylor and his son Leslie had moved in. They were still in residence in 1920. By 1930 Jonah, Jane and John Beattie had arrived but had gone by 1939 where the Register recorded Albert and Ellen Peace as the occupants. Albert was a farm bailiff. From then the residents changed on a frequent basis with the following living at Tanyard Farm until 1974: Mr. & Mrs. William Middleton; Mr & Mrs. Joseph Prescott and Mr. & Mrs. Patrick Kelly. The 1841 census records John Wilkinson and family, an agricultural labourer living here which is confirmed in the tithe map of 1846. Unusually both house and garden were owned and occupied by the same person. Between 1861 and 1891 a joiner from the Isle of Man, Charles Vost/e, and his wife Ann were living there. The spelling of his surname varied and in subsequent census returns the house is named after him. By 1891 Charles had retired and died in 1894 aged 80. In 1903 the freehold cottage called Vost’s Cottage together with an acre of land was put up for sale along with Lane End farm and other cottages along Well Lane. At the time the occupier was given as Mr. Thomas H. Anderson. It was sold for £280 to Mr Ezra Gandy for Miss Milner. According to the 1911 census this was called Vost Cottage and William Povey and his family was living there. The electoral register of 1920 shows James Thomas Scragg living in the cottage. Robert and Winifred Simpson were living at Vost Cottage when Robert died in June 1930. Robert’s parents William and Elizabeth lived just down the lane at Tanners Row. In 1939, gardener Frank and Jessie Ollier had moved in but had gone a few years later when it was occupied by William and Mary Orr from Scotland. In 1947, Mr and Mrs George Jones and in 1951 Mr and Mrs Jack Bate were recorded as living at the cottage in the Electoral Register. The house was demolished in the early 1970s and a bungalow built on the land. This was called The Shambles and too was demolished, and the present house now bears the name Dandycock Hall. The tithe map shows two cottages, outbuildings and gardens owned by John Percival, occupied by William Percival. The cottages no longer remain, neither does the garden other than the presence of a pear tree in the hedgerow opposite. Whilst the records are not always clear, we can be fairly certain that John and Sarah Doodson were living in one of the cottages between 1861 and January 1881. John was born in 1798 in Thelwall and married Sarah. The couple farmed a few acres attached to their cottage. Sarah died in 1871 and John in January 1881; they are both buried at Hill Cliffe cemetery. 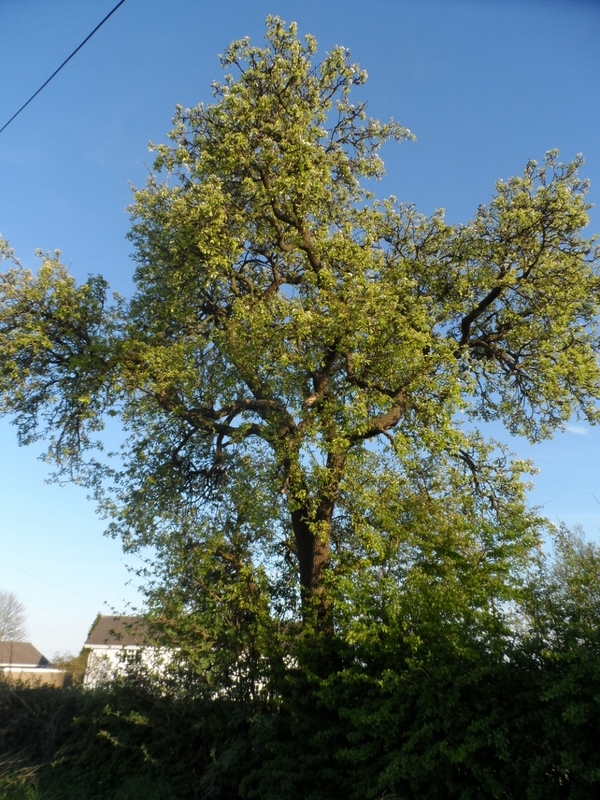 Next door in 1861 was John Done, an agricultural labourer born in Higher Whitley. In 1901 John Ellison a wheelwright and his widowed mother, Elizabeth, were living in Well Lane having moved from Dorothy Cottages along Stretton Road. Elizabeth died in February 1910 leaving her unmarried son John who was still there a year later. In February 1903 the two cottages were put up for sale along with Lane End Farm, Vost Cottage and the shop. At the time Mr. John Ellison was living in one cottage and Mr. Charles Gubbins in the other. The two cottages were sold to Mr. Jacob Sankey for £340. It is thought that these cottages were once the homes of labourers used in tanning hides, with the adjoining pond being used to wash and soak the leather. However we do know from the tithe map that the three cottages and gardens (along with Tanyard Farm) were owned by Thomas Percival of Antrobus and occupied by Sarah Barlow, Peter Highfield and John Jeffs. In 1861 George and Alice Highfield and family were living in the end cottage next to Sarah Barlow. The third cottage was unoccupied. It appears that George Highfield and his family were still living in Tanners Row ten years later in 1871, next door to Sarah Barlow. In 1881 John Clarke, a joiner, was living in one of the cottages with his wife and three children. Despite being born in Ulveston, Cumbria he had been brought up in Stretton by his grandmother, Catherine Cowap. In 1891 two of the three cottages were occupied – one by John Clarke and family; the other by Hannah Millward, a widow who had recently moved to the village. Mrs Millward was subject of discussion at the local sanitary board where she was described in a letter by the vicar as ‘a most troublesome tenant in the bargain. The cottage’ the letter continued, ‘is so old that it is very difficult to repair it properly. It is of no value to me, as the annual cost consumes all the rent and I heartily wish it could be pulled down and carted away.’ The Inspector said he did not ask for any action to be taken, but he should watch that the property was repaired. Hannah married George Simpson in 1898 and they moved up the lane to Peace and Plenty in Common Lane. In 1901 the following occupants are recorded at living in the three cottages: Albert Povey, a slater, and his family. Frank Bostock having recently moved there lived next door with his wife and young baby and Pete Cliffe lived in the third cottage; he was a gardener’s labourer aged 65, and a widower. Ten years later, Albert Povey and his family were still living at Tanners Row, the middle cottage was unoccupied but living at the end cottage was William Simpson, an agricultural labourer and his large family. This family was remembered by Tom Savage the children being Jenny, Nellie, Ruth, Elsie, Peter, Lizzie, Herbert, Bob and Ron. Sadly Herbert Simpson who at was recorded as being 14 in the 1911 census was killed in 1918 aged 21 and his name is inscribed on the war memorial in the churchyard along with eight other men from the village. According to the electoral register of 1920, Albert and Alice Povey were living next to William and Elizabeth Simpson and their respective families. 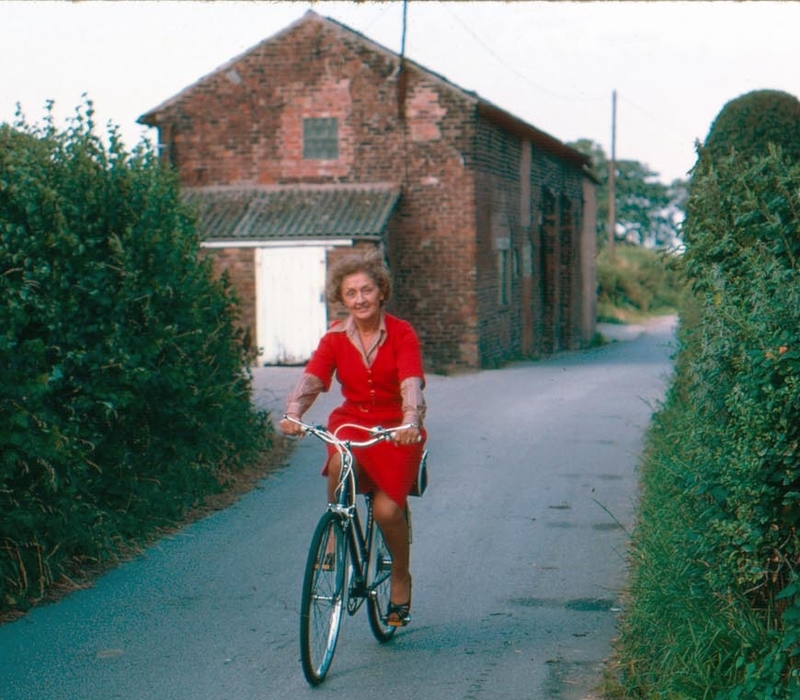 In 1939, George and Ann Bratt were in one cottage, with Thomas and Lily Jones next door. The couple had two daughters: Emily and Marjorie. In 1945 Cecil Coffin; Leonard and Dora Deakin were living at Tanners Row. According to Tom Savage, at one time lived Bill Leatherhead; Parking and another family. Mr. William Sollars and his wife Elizabeth were long-time residents of the middle cottage from before 1947 until after 1974. Jim Peters lived at the end cottage prior to 1961 until his death in May 2009. He became the carer for Mr Rob Turner of Moss Hall when he became ill with a degenerative condition and built a new bungalow called Mossways. This bungalow was built for Mr and Mrs Turner after they left Moss Hall. Betty and her little dog lived at Mossways until her death in April 2010 aged 79. Earliest records from the land tax show that Moss Hall was owned by the Rev Henry Offley Wright and farmed by Samuel Dyer from before 1785 until 1790 when the ownership changed to T Brook Esq. Samuel Dyer continued to farm the land until he was replaced by Peter Begauley in 1805. In 1810 both the land ownership and the occupation changed to Henry Clarkson and John Hasslehurst respectively. By 1815 the estate was owned by William Byrom from Moore and James Newton took over the tenancy having moved from Lymm. In 1830, the theft of his horse and cart made the newspaper in Chester: 1830 – Theft at John Newton’s stable. In 1837 the Moss Hall Estate of 90 acres was put up for sale by Messrs Winstanley & Sons, and included with it a seat or pew at the church of Great Budworth. The sale did not affect the tenancy. According to the 1841 census John and his sons James and John Newton were farming at Moss Hall. In January 1842 John senior died, and a few months later on 2 June 1842 John junior married Martha Jackson from Taynyard Farm just up the lane and they moved to a farm in Bold, Lancashire. In 1846 the landowner of Moss Hall was confirmed through the tithe records as Nathaniel Dennis Milner, meanwhile eldest son James continued farming until he moved to Glazebrook with his wife, Betty Ockleston, in the 1850s. By 1861 Matthew Shakeshaft and family were recorded as farming 200 acres and employing ten labourers. This was the largest farm in the parish. Shakeshaft and his family continued farming at Moss Hall until 1885-6 when they moved to Lymm, by which time Alfred Faulkner had moved in. Alfred Faulkner was married to Mary Ann Sankey whose father, Isaac Sankey, farmed next door at Moss Wood Farm. Mary Ann died in 1918 and Alfred moved to Little Leigh shortly afterwards. In 1895 tenant Alfred Faulkner raised concern at the newly formed Stretton Parish Council. The clerk was to asked to write to Miss Milner. re quality and water supply to the farm and premises occupied by Messrs. Faulkner. Moss Hall Farm was part of the Milner Estate, which covered around 1,100 acres. The estate was sold in 1918 and also included land that was managed from Old Farm. 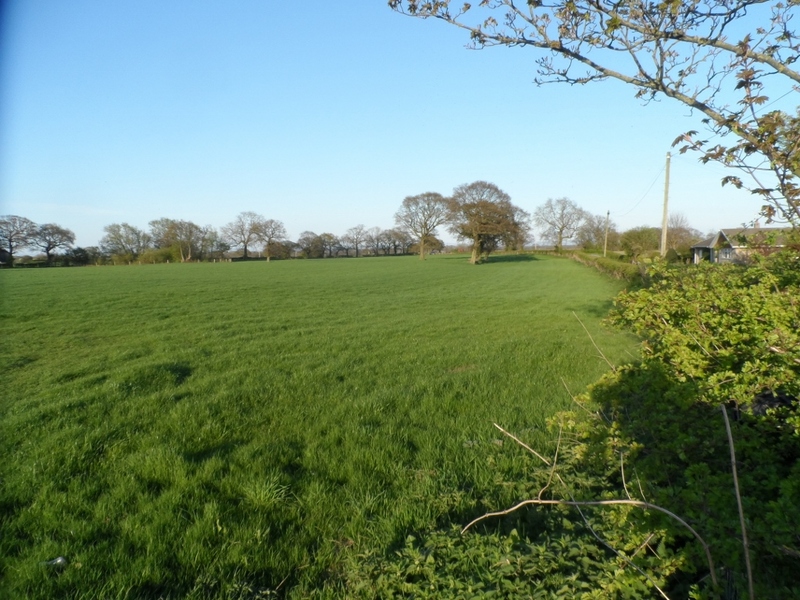 The details of the sale only provide the name of the solicitor for the vendor, however the newspaper article does say that the 206 acre farm sold for £9500. For more information on the history and landholdings in the area of the Milner family see here. George, Mary and Joseph Scragg followed. From the 1930s Joseph and Gertrude Taylor farmed at Moss Hall; Mr Taylor was a horse dealer. Following the Taylors were Rob and Betty Turner who lived there from the early 1950s until 1970 when they moved to Moss Ways due to ill health. The Darbyshires followed having moved from Lane End Farm. Thomas Bushell mentioned as living in Well Lane, wed my gt Aunt, Fanny Bennett in 1888 although some mystery surrounds the relationship as they never appeared to live together but had 4 children together! 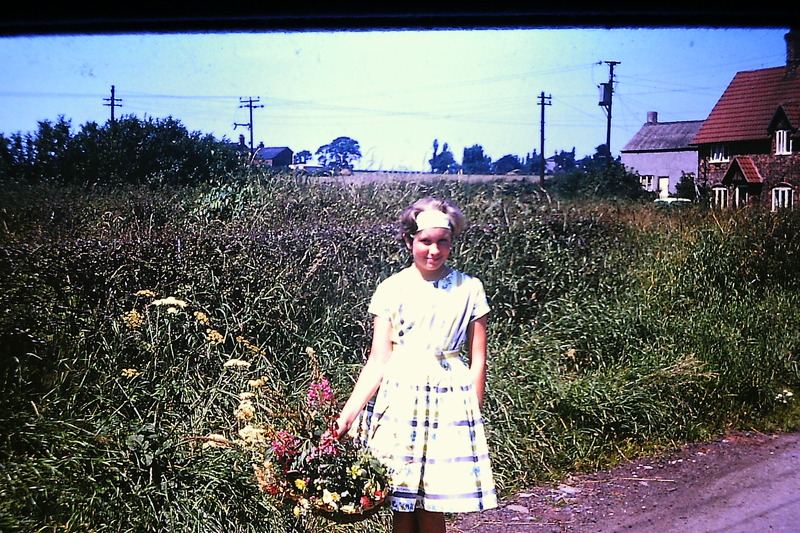 Are there any photographs of Thatched Cottage? I have been researching my family history and found a census return for 1871 and the address is Moss Hall, Stretton, Runcorn, Cheshire, England and the name was John & Sarah Doodson. Would this be the Moss Hall you have written about above? The next address is for a Tanyard Farm. Thank you. Thank you Clare for your answer, I think it said a couple of acres in the census, I wonder if I could ask you another question? I’ve done a search and found nothing, they were farming another few acres in a further census and it’s stated as Stockley Wood, do you have any knowledge where this was? Thank you ….Hope you don’t mind me asking! Hi Clare Many thanks for answering my question again, John & Sarah were at Stockley Wood in the 1861 census but their name was spelt Dudson. Yes 1871 & 1881 although I’ve never found the record for John’s death in 1881 I found the information from their gravestone in Hill Cliffe graveyard. They are buried next to his brother & sister Thomas & Esther with matching gravestones. It also says on their gravestone “also their son died young” but no name. Sadly all the records I’m told were in a fire at Hill Cliff Chapel so I don’t think I’ll ever know the name of the baby. Hi Clare, the Thomas Hankey referred to at Thatched Cottage (Corner House) was my 2nd cousin x 2 removed. Thomas was born in 1877 at Barnton and baptised there on 9th Sept 1877. He married Ellen Simpson at St Matthew, Stretton on 24th May 1915. His death is recorded at Runcorn in the Dec Qtr of 1957 Vol. 8a page 566.